For over 20 years, the Israeli dance troupe Mayumana has performed for audiences across the globe. 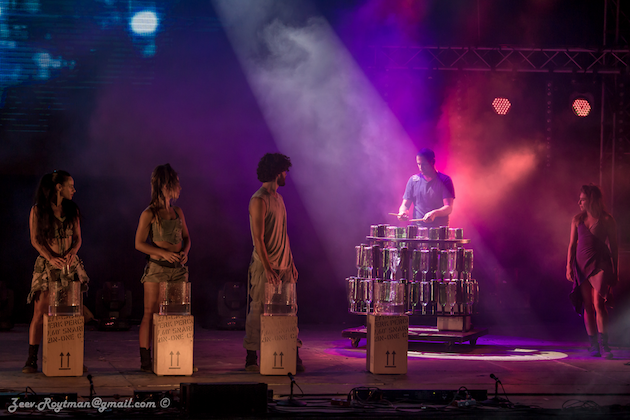 Combining song, dance, and percussion, Mayumana will perform their latest show Currents for one night at the Segerstrom Center for the Arts. Mayumana was created in 1996 by Boaz Berman and Eylon Nuphar out of their love for percussion and music. The name of the troupe comes from the Hebrew word for skill, which is perfectly depicts the group’s endeavors to “visualize the music” with its audience. Their show “BE” features a group of dancers, actors, gymnasts, musicians and singers who use instruments, voices and bodies to create a visual array of dance, movement and theater. journey between two troops, each representing a different view of the essence of light and electricity…each inspired by a different esthetic and artistic approach. The show is presented as a dialogue through unique sounds, lights and visual effects. The show combines a variety of elements: specially made musical instruments, massive video art projections (including video mapping on the walls of the Old City of Jerusalem), and eleven skilled performers in constant movement, playing on different instruments and musically juggling between different sounds. Currents overcomes age and language barriers with its incredible energy. The show will inspire audiences to take a pause from their daily routine to enjoy a breathtaking experience filled with color, music, and movement. Center Drive in Costa Mesa or by calling (714) 556-2787.